LOS ANGELES--(BUSINESS WIRE)--Halo Top is thrilled to announce the launch of seven new non-dairy and vegan-friendly pints hitting retailers nationwide in early February. The latest additions to Halo Top’s non-dairy portfolio include two completely original flavors, Toasted Coconut and Vanilla Maple, alongside fan-favorite flavors, Pancakes & Waffles, Birthday Cake, Candy Bar, Chocolate Almond Crunch and Chocolate Chip Cookie Dough. Named one of TIME Magazine’s “25 Best Inventions of 2017,” Halo Top has transformed the ice cream category. 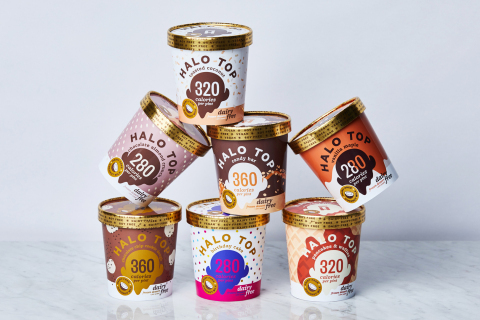 The newest seven non-dairy flavors will join Halo Top’s collection of 31 decadent yet guilt-free ice cream pints, including classics like Vanilla Bean and Chocolate, which complement other fan-favorite flavors like Peanut Butter Cup, Chocolate Chip Cookie Dough and Birthday Cake. Each of the non-dairy flavors ranges from 280-360 calories, with only 16-28 grams of sugar in the entire pint (i.e., 4-7 grams of sugar per serving). These brand-new pints are among seven other recently launched vegan-friendly flavors, including Sea Salt Caramel, Oatmeal Cookie and Cinnamon Roll. To taste the latest non-dairy and vegan-friendly flavors from Halo Top, head over to the freezer section of grocery retailers nationwide in February or purchase online here beginning today! To learn more about Halo Top, go to www.halotop.com or visit Facebook, Instagram or Twitter. 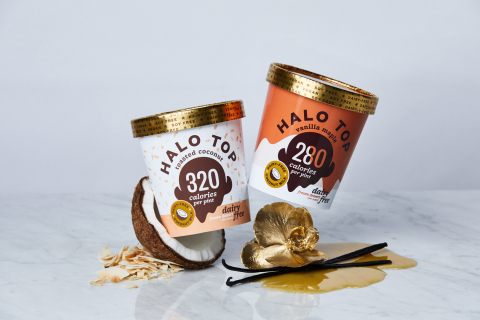 Los Angeles-based Halo Top Creamery was founded in 2011 by former lawyer turned ice cream aficionado, Justin Woolverton, while he was on a quest to find an ice cream he could enjoy without the guilt. Delivering premium ice cream people can actually feel good about eating, Halo Top is crafted with only the finest ingredients. Halo Top is available nationwide in the freezer aisle. For more information, please visit www.halotop.com and follow Halo Top on Facebook, Instagram and Twitter.